The data we have from GPS, the US military's Global Positioning System, which uses satellites to facilitate navigation, are casting grave doubt on Einstein's principle of relativity, says Thomas Phipps, Jr. of Urbana, Illinois. "The Global Positioning System (GPS) compensates the running rates of its atomic clocks for their orbital motion by speeding them up so as to cancel the relativistic time dilatation. Such compensated clocks, when in orbit, run in step with each other and with an earth-surface Master Clock. This means that a naturally-running proper-time clock placed in orbit without compensation for its motion must run objectively slower than its naturally-running counterpart on earth. There is consequently a factual clock-rate asymmetry between two inertial systems that violates the ordinary understanding of the relativity principle. In brief, clock rates represent physical observables not delimited by specific point events; therefore they do not conform to an event calculus and are not consistently described by special relativity theory." Phipps says that the principle of relativity, at least Einstein's version, is doomed. He proposes an experiment: measure the speed of light using the satellites in orbit. "... the vast teeming masses of academic physicists and others who believe implicitly in Einstein's form of the [relativity principle] deserve to be shaken up by a closer acquaintance with the facts. It is time for their Great God Consensus to experience another of His historic belly aches leading to a 'paradigm shift.' The experiment I have suggested might get that evolution started." The unavoidable success of the experiment will guarantee the triumph of Divine Albert's theory for at least 50 years. Tom Phipps' "GPS Evidence Against the Relativity Principle" has an incorrect definition for inertial reference frames. One of the postulates of Special Relativity is that the speed of light is constant in inertial reference frames. Tom is misapplying this condition to his hypothesis. An inertial reference frame is a locality in which all matter has constant inertia. This means no acceleration. Accelerating conditions do not apply to the constancy of the speed of light, as evidenced by the Sagnac effect. Rotation, even at constant angular velocity, is still angular acceleration! GPS satellites that circle the Earth in geosynchronous orbit are accelerating! The clocks in those satellites are expected according to SR to shift their time bases, not just because of their motion relative to the earthbound clocks, but also because of their acceleration. Some of Tom's statements are incorrect. In Section One, The GPS and Relativity Effects, one of many related statements is given, "A clock of the GPS when in orbit is in free fall - hence it is at rest in a locally inertial system and its motion is inertial." This description of "inertial" is not what is meant in SR. The orbiting clocks do have a different time base and the compensation scheme of the GPS is a practical and working adaptation to the relativity of the clocks. The problems that some scientists have with SR and GR are due to incomplete or incorrect understanding of SR and GR. It is imperative to understand what that postulate of inertial reference frames means. Conventional physics does not teach what happens when light travels through local space with accelerating matter in it. I tried to open this line of communication in a letter to the editor in Issue #64; Bill Cantrell diverted my effort, saying I asked the wrong question. Maybe it was a question he did not want to hear, but it certainly was the right one in my opinion! Here it is again, brought back by the feature article of Issue #67! Relativity is taught as a technology; we are only shown how to use it. The science behind Relativity is not explained; the "why" is largely unknown and certainly is not taught. We need to answer why Relativity is what it is, and this begins by understanging why Einstein put that limiting postulate into SR. The reason the speed of light is not constant in accelerating reference frames is that space is distorted by the motion of matter. Einstein said, "Space tells matter how to move and matter tells space how to bend." In accelerating conditions, that distortion changes with time, and spacetime is not the same for an emitter and its associated detector which is delayed in time by the propagation of light. What is warped space, or spacetime? GR already acknowledges that spacetime is alterable. Space is said to be empty, meaning space is not material. That does not mean it is nothing. It has properties, specifically it has permeability and permittivity. This is something, even if it is not matter. Dirac proposed space in a matter universe is composed of electron-positron pairs, or epos. They form a dipole, which is capable of exhibiting electric and magnetic polarization, just like material dielectrics. The orientation of these electron-positron dipole pairs is what causes electric and magnetic fields. Inertia is the inductive load that electric charges inside matter cause in the Dirac Sea. The motions of these individual, subatomic charges constitute changing microscopic electric currents that place inductive energy into the Dirac Sea, just like inductive energy is placed into the core of a coil of wire when electric current changes. It is no accident that the energy in a coil is L(I^2)/2, mirroring kinetic energy of m(v^2)/2. Induction L and mass m are directly analogous, as are current I and velocity v. Acceleration is analogous to the time rate of change of current or the second time derivative of charge. The epos' dipoles are stretched, storing that kinetic energy, finally providing a mechanism for it. In steady motion, there is no net stretching taking place. In acceleration, net stretching or unstretching occurs, causing the net energy flow. Stretch or distort a material dielectric and its permittivity and permeability are changed. The same applies to epos in the Dirac Sea, the vacuum continuum of space that was known one hundred years ago as the aether. Distort the Dirac Sea dipoles and the permeability and permittivity of free space are altered! The permeability and permittivity of free space are not constant!!! This is what warped spacetime is caused by! Einstein's tensors were tension vectors, or local isoclines of constant mu_0 and epsilon_0. Different tensor values mean different mu_0 and epsilon_0. This means matter and energy are electromagnetic in origin. When the speed of light changes, clocks and meter sticks change with the speed of light, as they are all made of the same primordial essence. This is why it is so difficult to detect changes in c.
When acceleration occurs within the reference frame, nonuniformity of the Dirac Sea occurs and a detector is not in the same, preceeding condition as the emitter! This is why the Sagnac effect detects changes in c by changes in interference patterns in a split light beam; the local speed of light does change in a detectable way. Changes in mu_0 and epsilon_0 also explain the Aharanov-Bohm effect, where the incremental magnetic fields of all current loops outside a solenoid or toroid superimpose to a B field of zero. Space is stressed by individual B fields, but, as shown by the Biot-Savart Law, their vector "summation" is zero. It is like a node in crossing waves; just because the amplitude is zero does not mean nothing is there! We have a lot to clarify and re-learn about Relativity. Einstein kept his nose clean by putting in that limiting postulate. SR and GR work as he set forth IF that postulate is rigidly adhered to and understood! thanks for sending the copy of your comment to IE. I think you are correct in pointing out that satellites, as they are orbiting, are not in an inertial reference frame, as they have centrifugal acceleration, albeit perfectly balanced by the countervailing gravitational force. Whether that invalidates Tom Phipps' thesis in its entirety, I cannot judge. Anyway, a point comes to mind spontaneously: For us living on a planet that provides the same type of accelerated reference frame, relativity should have little relevance. All of human experience - except speculation about the cosmos - would be at once removed from the realm of the application of relativity, as we are always accelerated in some way, going around the sun, turning with the earth on its axis, and indeed being part of our local galaxy which itself rotates and is thus subject to forces of acceleration. So the question comes up - if we exclude all those "normal" reference frames of our experience, what is relativity of use for. Now even imagining a set of reference frames that are in motion with respect to each other, but are not in any way accelerated, which would seem a highly theoretical configuration of events, logically the two observers that are each one in their own moving reference frame, cannot observe the same "beam of light" and measure the same velocity of it, if I understand correctly that that is what the postulate of invariance of light velocity implies. Quite apart from my personal views, can I post your reply to IE also as a comment on the article? 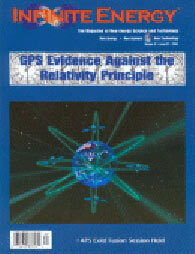 As pointed out on my web page regarding Global Positioning System (GPS) and Relativity, the way the GPS system is in practice used (namely by comparing the time signals of two different satellites rather than an absolute comparison with a ground clock), any potential relativistic effect would anyhow be negligible (it would amount to only a 1cm error in the position).